A great value pack of both the Perrin’s Blend ointment and the Creme Complete anti-ageing formula designed to correct sun damage, fine lines, and wrinkles. Used together these two products can support your skin to heal. Usually, Perrin’s Blend is used at night, and the Crème Complete during the day. The Crème Complete is a corrective cream, which is yellow in colour. Unlike the Perrin’s Blend, the Crème Complete, like any cream, is easily spread on the skin. Over time, use of the Crème Complete has resolved abnormal skin tissue and discoloured sun-damaged areas such as actinic keratosis and age spots. These areas will often peel away and return to healthy, normal looking skin. It has also had an extremely positive effect on Lichen Sclerosis. 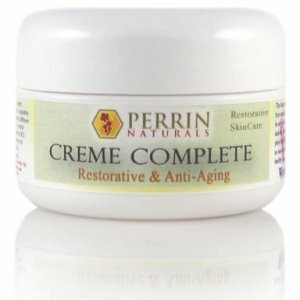 The Crème Complete is less concentrated than the Perrin’s Blend so it may take longer to work. Often people use the Crème Complete alongside Perrin’s Blend. This is especially helpful if the lesion is on your face and you need to be in public without a bandage on your face or a red ointment. Then you can use the Perrin’s Blend at night and the Crème Complete during the day or when out in public. UV rays can slow down progress in some conditions and reverse improvements. So covering the area and using a sunscreen – like the Perrin’s Sunscreen is important. If your condition is widespread you may want to wear clothing that keeps the whole area out of contact with UV rays. Perrin’s Blend is a natural blend of powerful antioxidants. Every ingredient in Perrin’s Blend can be purchased at a health food store and taken internally. Made with Raw Honey purchased directly from a honey farm, Grape Seed Extract, Ascorbic Acid (vitamin C), Natural Vitamin E, Grape Seed Oil, Alpha Lipoic Acid and NAC (N-AcetylCysteine). Perrin’s Blend is a thick sticky burgundy colored ointment used to correct specific spots of abnormal skin growth: skin lesions, moles, actinic keratosis, warts. Most of the customer testimonies that concern actinic keratosis and skin lesions involve the Perrin’s Blend™. The Creme Complete contains the greatest combination and highest concentration of restorative and corrective ingredients of any of our creams and moisturizers. The Crème Complete is completely natural. The Crème Complete restores, moisturizes, and protects. Creme Complete is organic aloe vera, grape seed oil, beeswax, vegetable glycerin, organic cocoa butter, natural vitamin E in soy oil, organic castor oil, vegetable derived emulsifying wax, almond oil, organic safflower oil, organic extra virgin olive oil, honey, lavender oil, lecithin, vitamin C, n-acetyl cysteine, resveratrol, alpha lipoic acid, sodium bicarbonate, grape seed extract, coQ10, biotin, vitamin A & D, lemon oil, frankincense oil, peppermint oil, geranium oil, cornstarch, cream of tartar, and rice flour. It is important to follow the directions closely and be diligent in the application. Directions: Apply Perrin’s Blend on the designated area and cover with a bandage. Do not wash off. When bathing keep the affected area covered. After bathing reapply Perrin’s Blend and cover with a new bandage. Perrin’s Blend can be applied daily or as often as desired. We recommend applying at least twice daily. Separation will probably occur so it may be necessary to stir daily or before each application. It is also helpful to take grape seed extract supplements. – Avoid contact with clothes. Perrin’s Blend will stain. Perrin’s Blend is a thick, honey-based burgundy colored ointment. – Although Perrin’s Blend has an extended shelf-life we recommend using it within one year. – If thickening occurs thin with pure honey. We have seen the best results when the place being treated is in constant contact with Perrin's Blend™, 24 hours a day. That usually means covering the area with a bandage to prevent the ointment from being rubbed off. We have also seen better results when the place remains covered when bathing to prevent a deep cleaning of the area, resulting in all the ointment being washed off on a microscopic level. We recommend changing the bandage after bathing and applying a new application of Perrin's Blend, and to avoid having a wet bandage on your skin. Blister Band-aids are a good option as they are waterproof and do not need to be changed as often. Keep in mind that this is the optimal approach. The area will need to be washed off periodically to prevent a build up of adhesive and for general sanitation purposes. If a growth is on a person's face then it may not be necessary to cover the area since the Perrin's Blend would probably not be rubbed off as easily as it would be on other areas of the body. 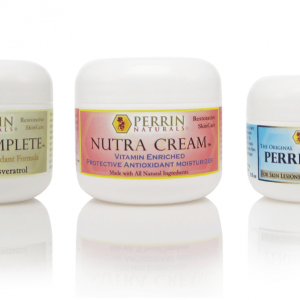 Sometimes Perrin’s Blend™ is used at night, and the Crème Complete during the day. The Crème Complete™ is corrective cream, light yellow in color. Unlike the Perrin’s Blend, the Crème Complete is spreadable. With extended use of the Crème Complete™ we have seen abnormal skin tissue and discolored sun-damaged areas such as actinic keratosis and age spots peel away and return to healthy, normal looking skin. It has also had an extremely positive effect on Lichen Sclerosus. The Crème Complete™ is less concentrated than the Perrin's Blend™ and it can take longer to work. Sometimes a person will use the Crème Complete™ in conjunction with Perrin's Blend™ if they can't use the Perrin's Blend™ all the time. For instance, if the lesion is on a person's face and they have to be in public and don't want to have a bandage on their face or a red ointment, then they will use the Perrin's Blend at night and when at home and the Crème Complete™ during the day or when out in public. Keep in mind that UV rays can slow down progress in some conditions and reverse improvements. That is another reason why covering the area is a good idea. But if a person's condition is wide spread they may want to wear clothing that keeps the places unexposed to UV rays. Sometimes there can be a reoccurrence if the usage is stopped too early. Sometimes a person will remove a skin lesion or actinic keratosis (pre cancerous sun-damaged spots) and will discontinue as soon as the place appears to be gone, and that is when the place may return. We recommend if a person experiences a correction in their skin disorder that they continue treatment at least a week (if using Perrin's Blend™) or use the Crème Complete™ for a period of time. We encourage our customers to read the Frequently Asked Questions Concerning Lichen Sclerosus, addressed and answered by Judy Perrin, based on her communication and conversations with countless individuals who suffer from LS. Application frequency varies. Customers who use the Crème Complete™ and Nutra Cream for lichen sclerosus will apply the products anywhere from 2-6 times daily. Customers who use the Perrin’s Blend will normally use it as a night treatment, or mix it with the Crème Complete to make it more spreadable. A Frequently Asked Question concerning Lichen Sclerosus: What products does a person need for Lichen Sclerosus? Many have called and emailed asking what to order for Lichen Sclerosus. In order to answer this I have written in detail, from my knowledge about the products and from customer input, about this subject. Possibly the strongest attack against the disease, Perrin’s Blend, is a sticky ointment By far it contains the highest concentration of the antioxidants Vitamin C, Alpha Lipoic Acid, and N-Acetyl Cysteine (NAC) and Grape Seed Extract, and Honey than any of our other products. For this reason it is possibly the most aggressive against Lichen Sclerosis (LS), yet if person is very raw and irritated, Perrin's Blend might be too harsh to start with because of the burning it might cause. Some who have been severely irritated have begun with Nutra Cream, our mildest cream, for a few days before even beginning with Creme Complete. 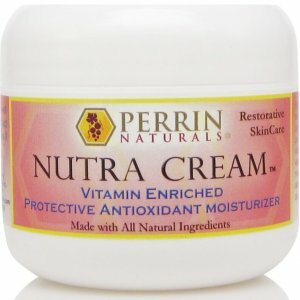 Nutra Cream, although higher in grape-seed extract than Crème Complete, contains less of the burning antioxidants, such as Vitamin C and NAC. It is a thicker cream, thereby creating more of a protective shield against urination stinging and itching. I first suggested using Nutra Cream to a mother with a ten-year-old daughter with LS. Within 3 days of using the Nutra Cream the mother called to say her daughter's intense itching had stopped and the skin looked healthier. We don’t have this mother’s report on our Web site, but she wrote a testimony for Oprah's forum for LS that you can read by going there. Another lady who was so badly inflamed that even using bathroom tissue caused bleeding, also started with Nutra Cream and has reported very good results. 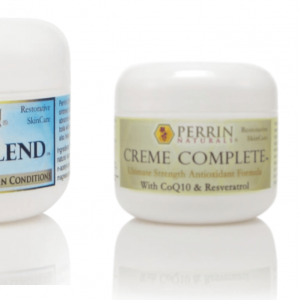 Many order two products to start with – Perrin’s Blend and Cream Complete – beginning first with Creme Complete, using it for a few days before introducing Perrin's Blend. If ordering these two together, be sure to scroll down to the on-line store to get the combination special price.